Tuft & Johnny Curtis in a Mini-Tournament to face Miz/Morrison..
Estrada defeated Rycklon & Gabe Tuft..
& Gabe Tuft defeated Ted DiBiase Jr. & Afa Jr. (the future MANU)..
& Gabe Tuft in a Elimination Tournament Match..
defeated Tyler Reks & Ricky Ortiz & Kizarny..
& Johnny Curtis defeated Sheamus OShaunessy & Ryback by DQ..
Curtis & Tyler Reks defeated Ryback & Sheamus OShaunessy..
& Johnny Curtis & DJ Gabriel w/Alicia Fox..
Johnny Curtis & Tyler Reks defeated Trent Beretta & Caylen Croft..
Curtis defeated Trent Baretta & Caylen Croft..
Johnny Curtis defeated Sheamus OShaunassy & Drew McIntyre..
Derrick Bateman & Tonga w/Abe Washington to retain their titles..
Curtis & Tyler Reks in a non-title match..
Championship Wrestling: Tyler Reks defeated Trent Beretta..
Hoyt and Alex Riley & Drew McIntyre..
win the FCW Heavyweight title. Tyler Reks defeated Lance Hoyt..
Alex Riley in a best 2/3 falls match to retain the FCW Heavyweight title..
w/Beverly by DQ when Riley hit Reks with a chair..
defeated Alex Riley w/Beverly Mullins..
champion Tyler Reks defeated Drew McIntyre and Sheamus in a 3-WAY..
2009--FCW: FCW Heavyweight Champion Tyler Reks defeated Drew McIntyre..
after interference from Fletcher Chase & Troy Jackman..
Tiffany to book him in a match next week on ECW..
defeated Tyler Reks & Yoshi Tatsu..
defeated "The So-Cal Surfer" Tyler Reks ..
Yoshi Tatsu & Tyler Reks defeated Shelton Benjamin & Zack Ryder..
September 3, 2009--WWE Superstars: William Regal defeated Tyler Reks..
Battle Royal (won by Zack Ryder)..
Tatsu in a dark match featuring ECW Superstars.. SmackDown! : Shelton Benjamin defeated Tyler Reks in a dark match..
8, 2010--WWE SmackDown! 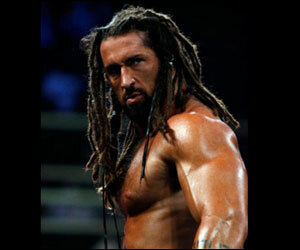 : Tyler Reks defeated The Hurricane in a dark match..
plane was unsafe. He then demanded to be deboarded. match Battle Royal (won by Yoshi Tatsu)..
Del Rio defeated Tyler Reks in a dark match.. Team SmackDown! at Bragging Rights.. Edge were the co-winners of a RAW vs. SmackDown! Battle Royal..
Masterpiece" Chris Masters with the burning hammer..
were the co-winners of a Team Rey vs. Team Alberto Battle Royal! Show & Kofi Kingston & Chris Masters & Montel Vontavious Porter..
Cody Rhodes & Jack Swagger & Tyler Reks..
were the survivors of the match! December 2, 2010--WWE Superstars: Tyler Reks defeated Trent Barreta..
December 9, 2010--WWE Superstars: Tyler Reks defeated JTG ..
January 6, 2011--WWE Superstars: Tyler Reks defeated JTG..
February 24, 2011--WWE Superstars: "The Masterpiece"
Chris Masters defeated Tyler Reks with the Masterlock..
April 21, 2011--Superstars: Tyler Reks defeated JTG..